“We all have those dark places, but we just don’t have the talent or vehicle to express them,” said Deborah Levin, his former agent. “John did.” Callahan’s “dark places” started early, when he was molested by a female teacher. He started to drink at 14, and at 21, let a guy he was bar-hopping with drive his car. The man crashed at 90 mph, leaving Callahan a quadriplegic. 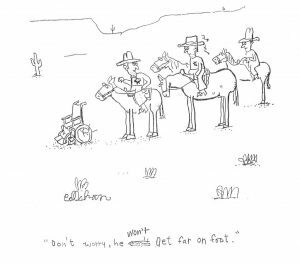 He turned to cartooning; his disability gave him a rough style, but it communicated his dark humor well (for example, the title of his “quasi-memoir” is Will the Real John Callahan Please Stand Up? The inspiration for the title of Callahan’s autobiography. The caption of one of his cartoons led to the title of his autobiography: Don’t Worry He Won’t Get Far on Foot: The Autobiography of a Dangerous Man. 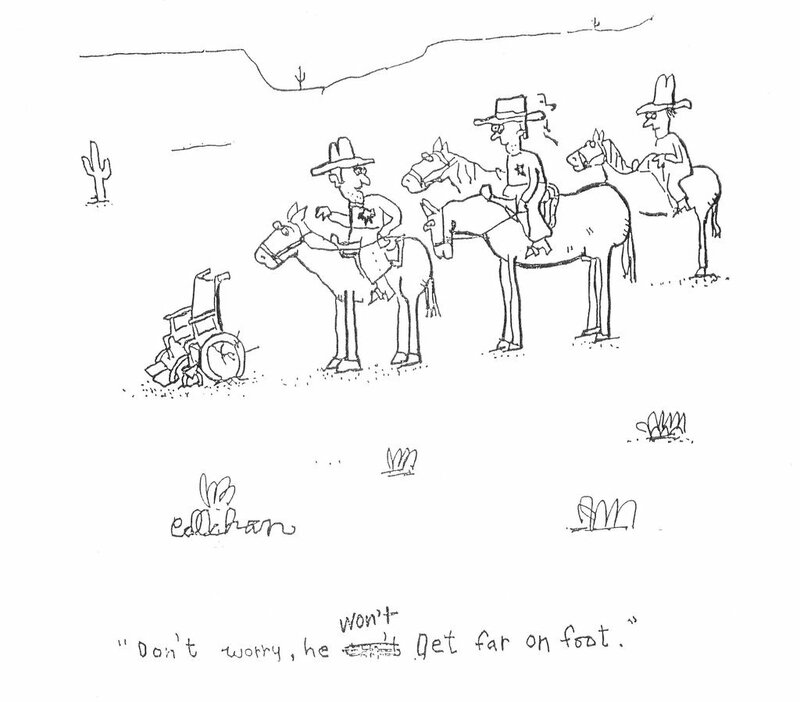 His single-panel cartoons spoke of real life with deep honesty — and drew criticism from people who thought he was insensitive to people with disabilities. “What he had to say was quite important, especially during these politically correct times,” says animator Bill Plympton. “A lot of handicapped people really liked what he was doing because they felt it was important that others didn’t treat them with kid gloves,” said his brother, Tom, adding that “Right down to the last moment, he could still crack a joke.” Callahan died July 24 from complications of his quadriplegia. He was 59.